2019 Yamaha R3 is set to launch towards the end of this year. The new-generation bike will be lighter and much more aggressive looking. Yamaha unveiled the 2019 R3 in October last year. The new generation gets some mechanical updates, decreased weight and revision in the styling. 2019 Yamaha R3 gets new 37mm Kayaba USD forks, which might not come to the Indian-spec. Even the Indian-spec Yamaha R15 V3 misses out on that, because of the cost check. The new generation will also get cosmetic upgrades that will make it look sharper. The front fascia gets a revision, which makes it look sportier. The windscreen is now taller, just like the R15 V3. Also, a faux air intake has been added up front. The fuel tank is also inspired by Yamaha R15 V3 and R1. On the front, you can see new 37mm Kayaba forks. However, the India-spec 2019 Yamaha R3 would use conventional telescopic forks, to keep the costs in place. 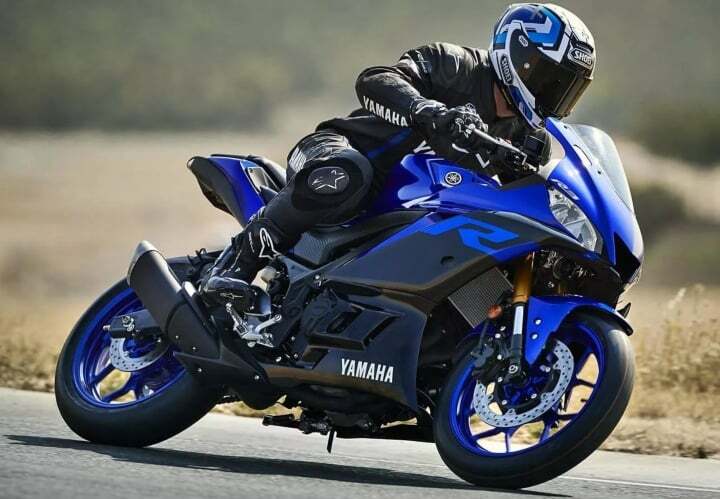 The reworking of the body and chassis of 2019 Yamaha R3, has reduced its overall weight by 4 kgs. The current one weighs 173 kgs. The handlebar is placed 22mm lower and a bigger fuel tank of is used. However, the fuel tank capacity remains the same. Lastly, it gets a new fully digital TFT colour instrument panel, replacing the digital-analogue cluster. The digital cluster provides information such as gear indicator, heat level, digital clock, riding range and more. The tail-part and the exhaust muffler remain the same. We have the leaked patent images also, which show the same changes. The 2019 Yamaha R3 would not get an engine upgrade. It will continue with the same 312cc twin-cylinder, liquid-cooled, DOHC engine. The engine delivers 42 BHP and 29.6 Nm of peak torque, mated to a 6-speed gearbox. Also Read: 2019 Yamaha FZ V3 launched in India – What’s New? Currently, it is priced at Rs 3.49 Lakhs (ex-showroom). We expect the prices to increase by a mere Rs 5000-10000. It competes with the likes of Kawasaki Ninja 300, Benelli 302R and KTM Duke 390.